Maybe it’s a shower where water rains down and sprays from all directions. 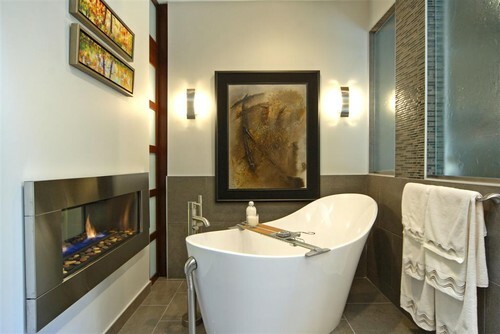 Or a soaking bathtub situated next to a fireplace. You can also add music and color to your shower, transforming a common bathroom into something exceptional. Freshome ranked custom walk-in showers as No. 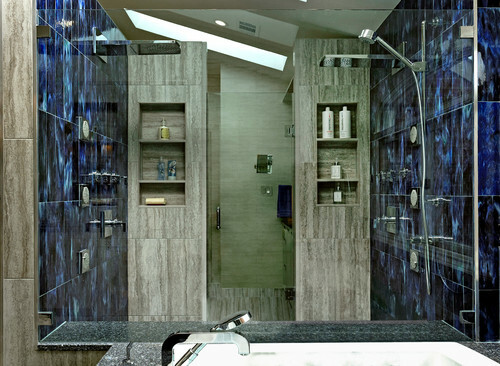 3 on their list of the hottest bathroom trends for 2014. With the addition of a “monsoon-like” shower head, you’ll never have to step into the shower stream — it’s everywhere. What could be more relaxing than a soaking tub? You can still find antique clawfoot tubs, if you have the budget for them. For a tub in great condition, expect to pay upward of $1,000. In fair condition, you’ll still pay several hundred, and you’ll also need to factor in the cost of refinishing. But there’s one other option, and that’s finding something new. A new soaking tub can still cost a small fortune, but choosing acrylic materials over cast iron and porcelain makes them more affordable. Another plus to an acrylic soaking tub is that they are much lighter, so they’re easier to install. And with a slipper-shaped tub, which has a high foot and head, you can fit one into a smaller space or have room for a fireplace. The classic spa look is usually fresh with whites and watery blue-greens. 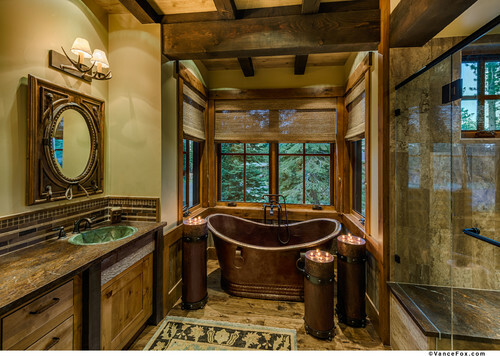 But there’s no reason why your master bath spa can’t have a more earthy appeal, especially if the rest of your decor has a lodge feel to it. Copper touches add a warm glow to rustic interiors, and they stand up to years of use. One of the aesthetic benefits of a more rustic spa bath is that earth tones aren’t as sterile-looking. Instead of harsh lights and brilliantly shining white fixtures, the warmth of indirect lighting, wood, stone, and copper can set a more relaxing scene. There’s nothing quite as harsh as leaving a therapeutic soak and walking out into a busy household. For the ultimate in a relaxing spa environment, think about adding a sitting area attached to the shower and bath where you can either wind down for bed or wind back up for the rest of the day’s activities. With a sitting area, you can put up your feet and read, take a nap, or even take in a little sunshine, if there’s a bank of windows. You’ll need seating that’s as comfortable as it is attractive, and a place to rest your feet is a must. And the farther it’s situated from the rest of the house, the better. A spa bath doesn’t have to equal an enormous financial investment. You might not have room to build a sitting area connected to your master bath, but maybe you can add one comfy chair. And if a custom, walk-in shower isn’t in your budget, you might work in a rainshower shower head and jets for the walls. Your master bath spa can look and feel any way you want it to. Aim for classic fresh colors, or opt for darker, soothing tones. Choose tile for the floor, or go with wood or some of the good-looking vinyl that’s on the market. Your choices are virtually endless. If you could transform your master bath into a master spa, which elements would you choose? We would love to hear about what inspires you!